The township of Arcadia, home of Arcadia Daze every July, is less than 15 minutes north of Onekama. 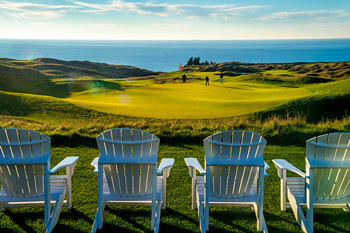 Arcadia Bluffs Golf Course: A nationally recognized first-class golf course, the Bluffs also offers fine dining and bagpiper music with a gorgeous view of Lake Michigan. 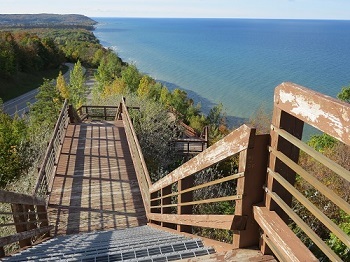 Inspiration Point: This popular spot along M-22 is the perfect place to get a look at Lake Michigan and the surrounding topography and absolutely breathtaking at sunset. Arcadia Marsh Nature Preserve: A short trail in the Great Lakes Coastal Marsh, this area is one of the last protected marsh area. It’s a beautiful walk and a great spot for birding. Arcadia Area Historical Museum: Learn about local history in a charming Victorian home with exhibits on the railroads, shipwrecks and the lumbering era. While a small town, Arcadia has a lot to offer the adventurous outdoorsman. Great fishing and boating opportunities are available. The Arcadia Marsh Nature Preserve, right on M-22, is a hidden gem that is relatively unknown. It’s a beautiful walk, and you are sure to see several species of waterfowl. The Arcadia Bluffs Golf Course offers some of the best golf in the country with challenging greens and legendary sand traps, as well as a superb fine dining kitchen. Arcadia has a few local business that are really worth the stop. Take a step back in time and visit the old fashioned sweet shop, The Arcadia Icehouse. Pick up some fresh Sievert’s maple syrup or Miller’s produce. If you are looking to spend the night, the Arcadia House Bed & Breakfast will welcome you with open arms.